Like the gift of travel... but a lot cheaper. 1. Matcha Kit Kats, the best candy for anyone who loves green tea. Get a bag of minis from Amazon for $4.39. 2. Snack packs of Takis Fuego, Mexican chili pepper and lime chips that are rolled up tight. Get a pack of 12 from Amazon for $18.99. 3. A Cadbury variety box approved by the man in red himself (it's Santa). Get a box from Amazon for $9.40. 4. 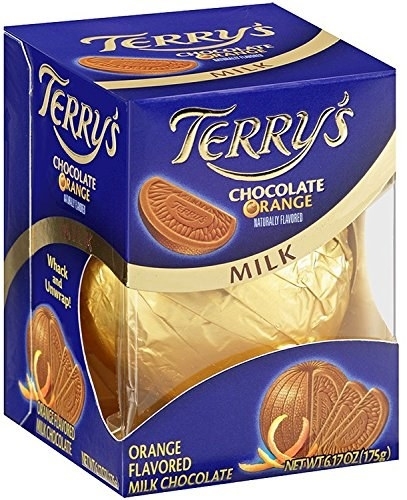 Or a mega pack of just Cadbury Crunchies, crunchy honeycomb drenched in milk chocolate. Get a pack of 24 from Amazon for $15.99. 5. An assortment of sweet and savory Japanese snacks for anyone who is still saving for a transcontinental flight. Get a pack of 34 snacks from Amazon for $12.49. And get the Christmas pack (pictured on the right) here. 6. A ~value pack~ of Tim Tams for any chocoholic who longs to go down under. Get a pack of 18 from Amazon for $12.79. Or get a four-flavor sampler pack here. 7. A variety pack of Pepero, Korean biscuits covered in chocolate (and a variety of other toppings). Get a 12-pack from Amazon for $27.97. 8. 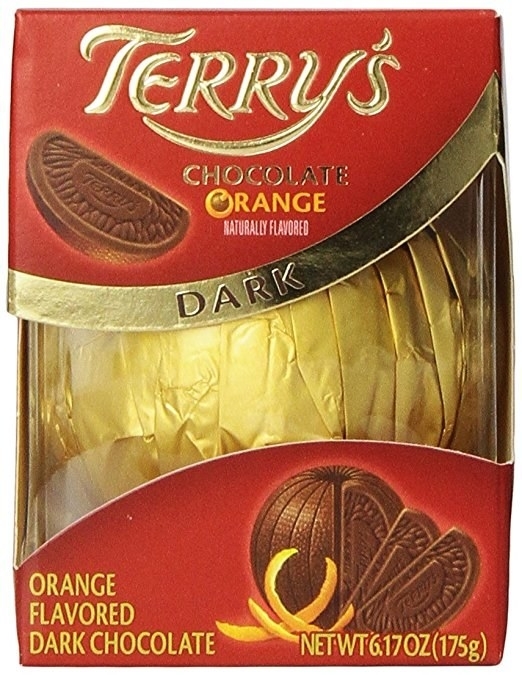 A classic chocolate orange for the perfect last-minute stocking stuffer. *Cracking it* might even be better than eating it. Get a pack of six oranges from Amazon for $28.99. Available in dark and milk chocolate. 9. A handful of Sonho de Valsa chocolates, a Brazilian bonbon filled with cashew cream. Get a pack of ~50 from Amazon for $32.90. Get a pack of six boxes from Amazon for $19.58. 11. Torontos, Venezuelan chocolate-covered hazelnuts for anyone who loves Nutella (but needs to branch out). Get a box of 36 from Amazon for $15.94. 12. A bag of Boy Bawang, a Filipino corn nut snack that packs a garlicky punch. Get a three-pack from Amazon for $9.11. 13. Halley, a Turkish treat consisting of a biscuit-and-marshmallow sandwich coated in chocolate. 14. A box set of elegant Tunnock's Tea Cakes for a chocolatey, marshmallowy Scottish treat. Get a pack of 6 for $5.27. 15. Milk chocolate filled with salty black licorice for anyone who knows that sweet and salty is the best combo. 16. Sesame-flavored flour cakes that provide the perfect amount of chewiness. Get a pack of 18 for $13.99. 17. A bar (or three) of Milka TUC, which combines the magnificence of Swiss milk chocolate with a Ritz-like cracker. Get a three-pack from Amazon for $7.09. Also available in CHIPS AHOY and OREO versions. 18. Turkish biscuits topped with fruity jam and sprinkles for anyone who knows that sprinkles make every sweet treat better. Get them from Amazon for $3.99 each (orange here and strawberry here). 19. Taiwanese sugar-glazed rice crackers for anyone who takes snacking to the next level. 20. Kinder Happy Hippos chock(olate) full of TWO KINDS of cream. One reviewer claims that these "may be the key to world peace". Get a case (10 packs of five) from Amazon for $20.51. 21. A gift box of alfajores, a Spanish cookie sandwich filled with dulce de leche. Get a dozen (wrapped in a gift box) from Dulce Arte on Etsy for $18.95. 22. A box of Ibarra Chocolate Tablets, slabs of chocolate with cinnamon and coarse sugar that make delicious Mexican hot chocolate. Get it from Amazon for $9.51. 23. An adorable pouch of Hello Panda filled with chocolate cream that melts in your mouth. Get a pack of 10 from Amazon for $10.99. 24. A triple value pack of Jaffa cakes to share with family members who argue over whether they're cakes or biscuits. Get a 36 pack from Amazon for $7.19. 25. A festive tin of Walkers shortbread in holiday shapes. Get the holiday tin from Amazon for $21. 26. Chili-coated mango lolipops for anyone who is both sweet and spicy. Get a pack of 40 lollies for $7.30. 27. A gift box of marzipan-style peanut candy wrapped in pretty rose packaging. Get a box of 30 from Amazon for $7.89. 28. A winter-themed bag of chocolate bonbons filled with hazelnut cream. Get a jumbo bag from Amazon for $12.99. 29. A bag of Walker's licorice toffees for any anglophile. Get a bag from Amazon for $8.18. 30. A box of Spanish Turrón made with Marcona almonds. 31. And a 27-pack of McVities Penguins that'll keep the whole family happy. Get a pack of 27 from Amazon for $10.19. Get a toffee version here and an orange version here. Brb, just waiting for Kinder Surprise to become legal in the U.S. again.